While most area farmers are likely more worried about treating mustard and other summer annual weeds in their wheat right now than about stripe rust (see our postcard article below), K-State is working on predicting the severity of stripe rust later in the season. A recent K-State Extension Agronomy eUpdate article predicts a moderate risk of treatable stripe rust in Great Plains wheat this spring. 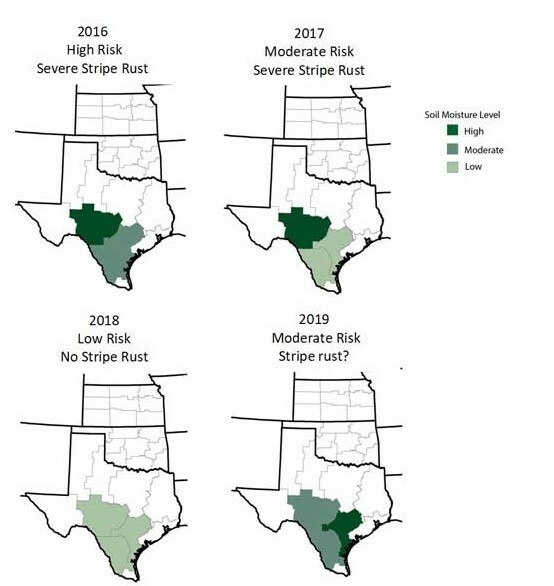 Previous year's predictions using soil moisture data in Texas have proven reasonably reliable (see figure), but it is too early to be sure if local farmers will have to treat for rust. We attend this meeting every year because it the largest collection of aerial application expertise in the world. If you want to know what is new and emerging in the ag aviation world, you need to attend. establishes that you have a legal right to repair something that you own. .. The Post article quotes Nathan Proctor as saying, the new exemption “establishes that you have a legal right to repair something that you own and that does not infringe upon the copyright protection afforded to the manufacturer.” One catch is that while tractors and automobiles are included in the new exemption, aircraft and boats are excluded. The issue is complex, and you can read our previous articles here, or read this excellent summary from the Electronic Frontier Foundation (EFF). This manifesto by iFixit is also worth a look. So farmers can now legally repair their own tractors, if they can hack through the DRM which is designed to prevent them from doing that very thing. Since the Copyright Office doesn't require manufacturers to provide DRM access to the owners of the equipment, the ruling might be a hollow victory in some cases. We will keep following the story and keep you posted. In the meanwhile, you might consider donating some money to the EFF. It's a good group. Kochia is becoming resistant to fluroxypyr (Starane) according to this article which outlines recent research done by KSU at the Hays Agricultural Research Center. In this USDA article, Sonny Perdue, Secretary of Agriculture, praises the Department of Justice for appealing the ban ruling. In the appeal, the DOJ asks for an en banc hearing, which means all of the judges will hear the case as opposed to the original 3-judge ruling. The full panel could overturn the previous ruling, which was a 2-1 vote. The DOJ's request was supported by many major farm groups with amicus curiae briefs. The USDA article says, "The decision appears to be based on a misunderstanding of both the available scientific information and EPA’s pesticide regulatory system. The U.S. Department of Agriculture (USDA) and other groups have pointed out significant flaws in the draft chlorpyrifos assessments on which the court based its opinion, and USDA supports EPA’s conclusion that the available scientific evidence does not indicate the need for a total ban on the use of chlorpyrifos (emphasis ours)." The article continues, "EPA should be allowed to continue its ongoing science-based and expert-led evaluation of chlorpyrifos, which is part of EPA’s registration review program that covers all pesticides." We agree with the EPA on this issue. Regulations should be based upon science. 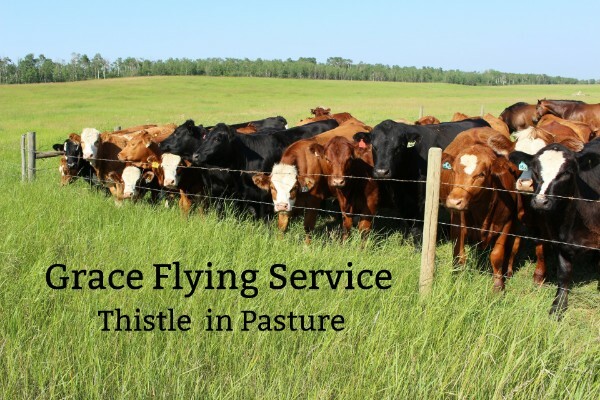 Fall is the best time to treat pasture thistles--musk, bull, and Canada. Please contact us now to treat your pasture ground. We need your order and maps so that we can plan an application schedule. The window of opportunity can be very short in the fall, and small field sizes means multiple customers for a single load. Our deadline for taking thistle orders is Monday, October 8, 2018. Musk and bull thistle can be treated until the ground freezes, but Canada thistle needs to sprayed before a killing frost. We think the best chemical choice is GrazonNext HL, which is Milestone in a pre-mix with 2,4-D. 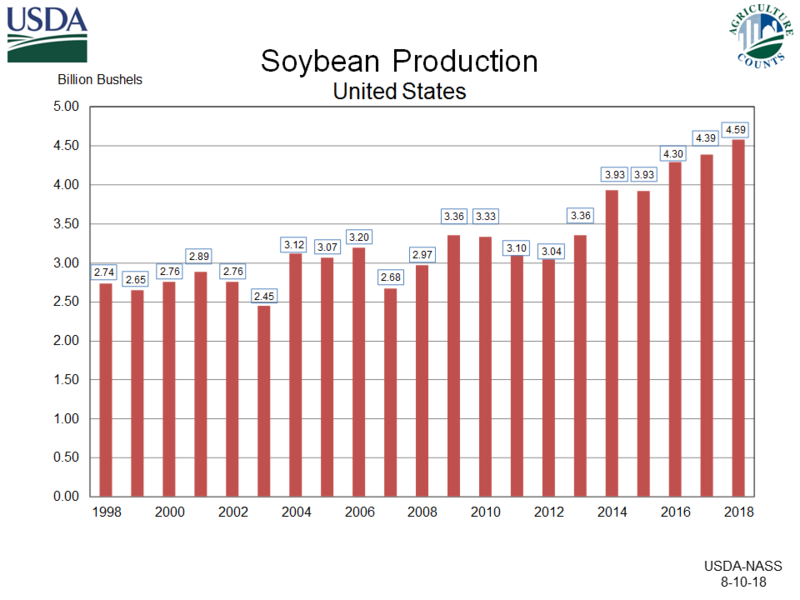 In this article, Reuters reports that the Trump administration has promised to "provide up to $12 billion in aid for U.S. farmers in early September to shield them from the repercussions of trade disputes between the United States and China, the European Union and others." There are many more stories to read in our archives. Please click here to read our archived stories. Or use our search page to find keywords on our website.